Illustration of carbon nanomaterial membrane. Membranes made from carbon nanomaterials like graphene or nanotubes could make fresh drinking water more available to more people – especially in developing countries. To make this happen, progress is needed to solve the physical factors that limit the removal of impurities, membranes must be scaled up to industrial levels, and costs have to come down, according to scientists Kunli Goh and Rong Wang from Nanyang Technical University in Singapore and Yuan Chen from the University of Sydney in Australia [Goh et al., Carbon 109 (2016) 694]. Separation membranes based on polymers are widespread in the production of demineralized or potable water, as well as in pharmaceutical and food production. In more specialist niche sectors, ceramic membranes can have advantages. 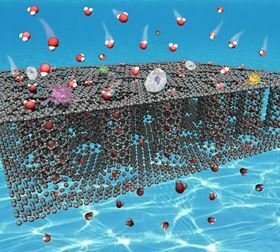 But carbon nanomaterials (CNMs) have exceptional – and unique – water transport and sieving properties that could allow them to take over from polymeric membranes. “CNMs hold promise to transcend limitations owing to their atomically smooth graphitic surfaces and unique structural and water transport properties,” explains Chen. It is possible to create very small and well-defined pores in very thin layers of these materials that very effectively filter out and separate impurities. CNMs are also antimicrobial and can help address one of the key limitations of conventional membranes – fouling, which is the build-up of impurities like bacteria, fungi or other particles on the membrane surface. Membranes made from these novel materials could have an added advantage. Because CNMs are conductive and easy to functionalize with other species, it is possible to imagine ‘smart’ membranes that not only intrinsically monitor fouling but also electrostatically ‘self-clean’ their surface. “These [factors] suggest that [CNMs] can be used in more robust membranes to tackle more polluted water and hostile separation applications involving high pH, high temperatures, and organic solvents,” says Goh. But despite the enormous promise of CNMs, there are some crucial issues to be overcome. Although almost ‘ideal’ membranes can be made from single sheets of graphene or aligned forests of nanotubes, they are difficult to fabricate – especially on larger scales. More practical options – based on graphene composites or randomly aligned nanotubes – still need to be stable, robust, and cost effective. CNM membranes could fill the gap between polymer and ceramic membranes, suggest Wang and Chen. But to unleash the full potential of CNM-based membranes, research needs to move away from creating evermore ‘ideal’ ultrapermeable membranes to more practical issues like stability, scalability, safety, and cost.